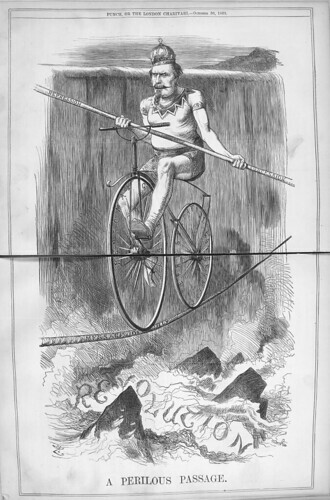 Punch magazine cover (8 August 1863), illustration by Richard Doyle. Mr. Punch creating the Large Cut himself (the main cartoon in Punch), using his dog Toby as a model for the British Lion, with a crown upon its head. Image: British Library Board. 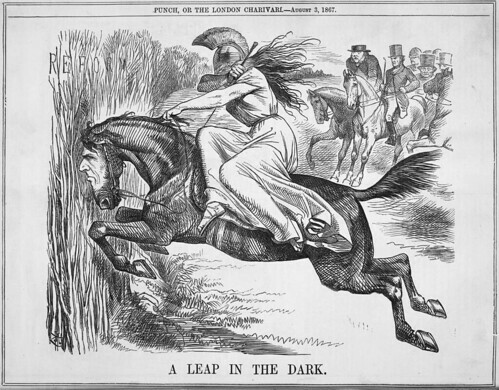 Below: ‘A Leap in the Dark’, Punch (3 August 1867). This cut shows Disraeli as a runaway horse carrying Britannia into the thicket as Britannia covers her eyes – Gladstone, Bright and other MPs hang back, looking on. Image: British Library Board. 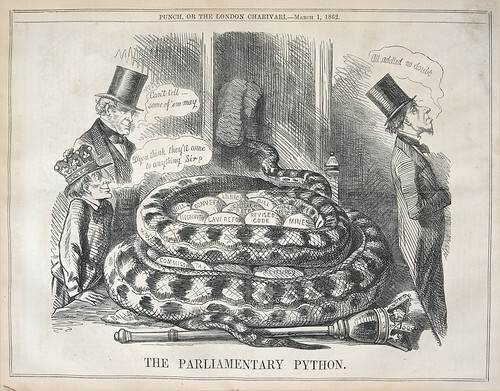 Below: ‘The Parliamentary Python’, Punch (1 March 1862). 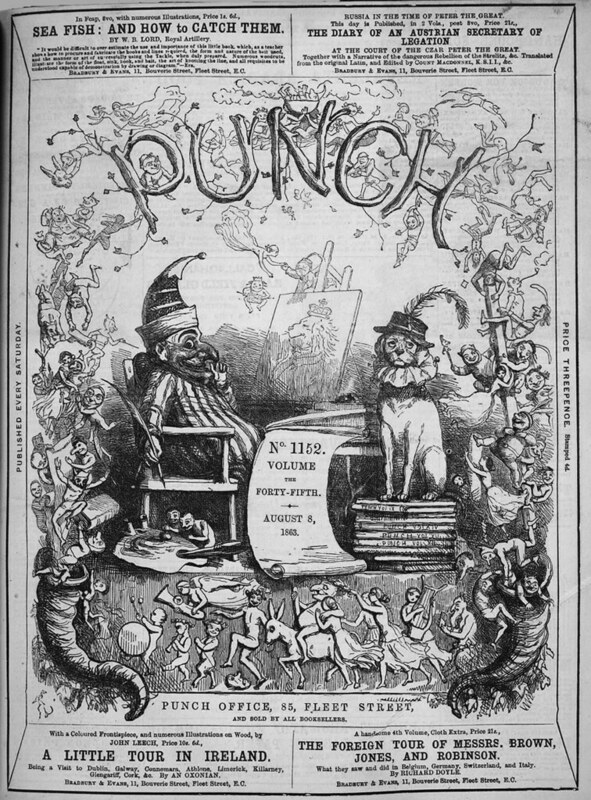 Punch Readers frequently sent in suggestions for cuts that coupled political and non-political events and on very rare occasions their ideas were actually adopted. The story behind this image is that in 1862 John Leech brought to one dinner meeting a sketch by a lady of a Parliamentary python hatching bills, a reference to the keen public excitement about the fate of the pregnant python at the Zoological Gardens. Image: British Library Board. Above: ‘Please to Remember the Grotto’, Punch (14 August 1858). 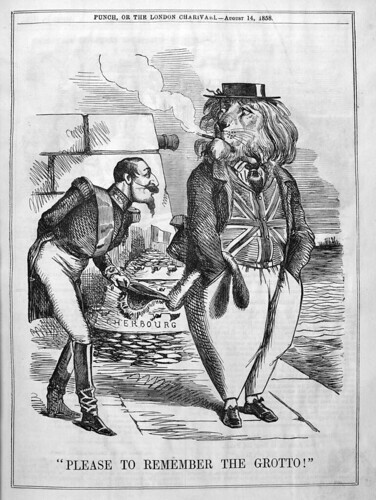 This obscure cartoon shows Louis Napoleon at Cherbourg, tipping his hat to the British Lion (who is dressed in holiday clothes) and saying, ‘Please to remember the grotto!’ It satirizes the French emperor’s childish pride in what he has built, while depicting him as making an annoyingly intrusive request for trust from a wary British Lion who keeps his hands firmly in his trouser pockets. Image: British Library Board. The Punch Brotherhood: Table Talk and Print Culture in mid-Victorian London (price £25) is available from the British Library Shop (t: +44 (0)20 7412 7735; e: bl-bookshop@bl.uk) and online at bl.uk/shop.